As an upgrade to the venerable SMX line of sport bike riding boots, the Alpinestars SMX-6 v2 Boots arrive for the spring of 2017 with the same look and style as their predecessor, but with a few notable updates. The biggest upgrade is safety-oriented, and will be great news to riders. The SMX-6 v2 Boots now have hard armor on the medial side of the ankle bone. In addition to that, the TPU ankle brace system has been refined to further limit lateral flex while still allowing the foot to move up and down freely. From a comfort perspective, there are new, larger bellows which come further down the instep, making the boots a little easier to walk around in. Lastly, Alpinestars improved the sole on the SMX-6 v2 Boots to be stickier in all situations - on the bike, off the bike, in the wet, and in a dusty garage or paddock. 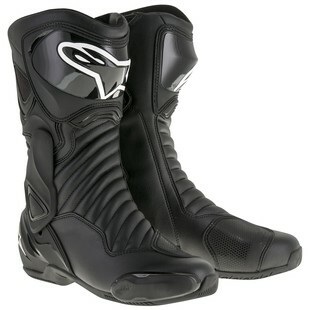 The SMX line of sport riding boots has always been a go-to option for the rider looking to hit some canyon roads, or even check out a track day or two. Now, with the newest iteration of the SMX-6 v2 Boots, the best in the category just got better.